This magazine was correct when it went against industry wisdom and predicted in a January / February cover story on Bombardier that a punitive 292 per cent tariff on C Series airplanes exported to the United States had no where to go but down. But few could have foreseen that the U.S. International Trade Commission (ITC) would ratchet the amount to zero. Especially in a heightened period of U.S. protectionism. The leap from propellers to jets or narrow-body to wide-bodied aircraft notwithstanding, the C Series may be the most disruptive airliner of its class ever brought to market – albeit not in a way Bombardier first envisioned. Or would have liked. By stepping into the smaller end of the Airbus-Boeing single-aisle sandbox, Bombardier had already forced the hand of the big two. Re-engined versions of the A320 and Boeing 737 were unveiled, whereas the manufacturers may have preferred to wring out the last drops of sales potential from the existing platforms while preparing to come to market with clean sheet designs. It appears that Boeing was further down that path with a 737 replacement based on the 787, and will likely be first out with a 797, a so-called middle-of-the-market design that Airbus suggests is already sown up with the A321neo (new engine option). What came as a surprise is that the Boeing trade dispute would drive the C Series into the arms of rival Airbus, triggering a re-positioning of the global chess pieces. 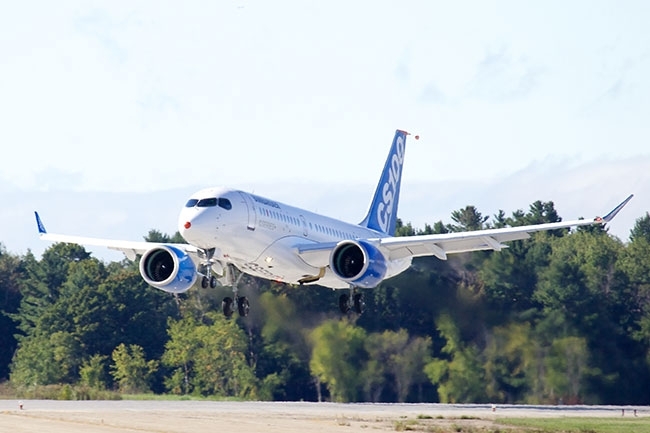 As the U.S. ITC made clear, Bombardier did not engage in anti-competitive behaviour in landing a Delta order for up to 75 CS100 jets, because Boeing never had a competitive airplane in the running. After cancelling the 717 in 2006, it still doesn’t. But Airbus now does, neatly filling a gap in its product line – sending Boeing south to Brazil, where the American company already has a co-operative relationship with Bombardier’s regional jet rival, Embraer. A takeover of Embraer by Boeing is out of the question. The airplane maker is the crown jewel of Brazil’s high-tech sector. Greater collaboration with Embraer’s next-generation E2 jets – including a potential equity stake in the program – cannot be ruled out, giving Boeing a presence in the 60-to-100-seat market similar to the tie-up between Airbus and Bombardier. The rest is crystal balling. The ITC ruling has kicked away the primary case underpinning a second North American CSeries assembly line in Mobile, Ala., where Airbus already builds A320s. Even so, Airbus and Bombardier are moving forward on the U.S.$300 million production line, which could open within 12 months of receiving a regulatory green-light on the CSeries deal. There is no doubt that the Airbus partnership has delivered a marketing boost for Bombardier. A recent “pause” in orders has been attributed to airlines trying to sort out what’s what, and ensuring that regulatory approval is in place to secure the future of the CSeries. The silence could be broken with a splash at this year’s Farnborough Air Show, where Bombardier launched the program in 2008. The ruling does free up Delta to take delivery of Canadian-built CS100’s until the Alabama site opens. Airline customers would prefer more and not fewer manufacturers competing for their orders. That is currently not possible in the wide-body sector, and will likely remain that way until at least 2030, when a China-Russia consortium produces a jumbo jet to compete with the 787 and A330neo. Neither Airbus nor Boeing compete directly in the 100-to- 150-seat market, although the presence of the CSeries and E-Jet did influence pricing of larger A320 and 737 airplanes, giving buyers four competitors in one lucrative sector. Ironically, the industry’s reluctance to buy the CSeries has resulted in a consolidation of sorts. Depending on the outcome of talks between Boeing and Embraer, the game board could be reduced to two players, with Airbus and Boeing setting the terms. Since launching the CSeries 10 years ago, Bombardier has stirred the pot. The world’s two giant airplane builders have had to play catchup (while easily surpassing the CSeries in sales). A bitter trade dispute has resulted in a partnership that delivers added muscle to the CSeries program while giving Airbus an overnight advantage on its rival in a market segment – where Boeing was competitive before cancelling the 717 – with clean-sheet, advanced technology, setting the stage for an inevitable tie-up with Embraer, which once had a competitive leg up on rival Bombardier with its E-Jet program. Disruptive technology, indeed.